I am allowing myself to count, or at least I am telling you I am counting. I can see the end of this trial. I am no longer counting in weeks but I am counting in days. We have had so many countdowns going on around here with the end of EOGs, EOCs, exams, school, leaving for camp, Montreat, Justin’s 16th birthday and when Mom can drive. It has been hard to keep up with which countdown we are discussing! One thing is certain, my quiet house is suddenly full of voices and that makes me so happy. I have had a LOT of time to digest the changes to our lives that epilepsy and brain injury brought me. Some days felt like forever. Justin had to get up at 5:25 for school. Yes, it is insane. Then round two starts at 6:45. Then it is just the dogs and me until 3pm. For several months I couldn’t work out and honestly I just slept most of the day. I was so drugged up playing with so many medications I didn’t know which end was up waiting until July felt like eternity. Mom was sick, I couldn’t help her. I couldn’t even grasp how she was because I couldn’t get to her and I was angry. I hated being dependent on people every time I needed to go anywhere. I felt so much pressure to have my act completely together anytime I asked anyone for anything because I knew I was already inconveniencing someone and I didn’t want to be any extra trouble. You do not know what real freedom is until you don’t have it anymore. Truly, there were days, 3 or 4 in a row where I did not leave the house. Sure I walked the dogs. But days that I did not get in the car, did not have the need to, as Emmer would say “put myself together” and get out. I know how she felt those last years when she was stuck in her room in healthcare and she didn’t know what day it was. Were it not for the kids coming home at 3pm the beds wouldn’t have been made and I probably wouldn’t have showered. Everyday, by 3pm, the house was presentable and I was at least physically presentable. Some days were wonderful, some were normal, some were sad, some were dark and desperate. I had never faced the reality that I will live with epilepsy and seizures for the rest of my life. I always planned that we would control it with medicine and I wouldn’t have to worry with it. That is the most likely case, but I do need to be prepared for the possibility that may not happen. There is always the chance that I will have more seizures and be back in this same place again. Mentally I needed to swallow that big pill, along with another 5 or so. I have seen that I can do this. If I have a seizure tomorrow and the clock restarts we will all deal with what comes our way. Our Lord is ever faithful. He has shown me that, day in and day out. When I was on my knees in prayer and when I was on my knees in tears. He was, is and will be faithful. The little things have meant so much. People have called and made time to take me to lunch. Those were days I really looked forward to. I got to put myself together! I have a couple of special friends that would drop notes in the mail every so often just to say hello and they were thinking of me. Those notes always arrived on days that I needed a little extra hug. To me, weekly rides for the kids were huge, but the people providing them say they were little so I’ll call them little. These little rides home from Chess Club, baseball practice and games, church, small group, drum lessons, play dates, sleepovers, I could go on and on. Several people have taken on my kids for this entire seven months and are transporting them where they need to be on a weekly basis. They show up without reminders and it means all the world to me. These adults willing to go out of their way mean our kids don’t have to sacrifice something they enjoy because of my health. As parents you all know what that means to us. These are the things I remember…quiet acts of kindness. Getting moving again. This was a hard one. The doctor wouldn’t let me work out for some time after my seizures. Then she let me slowly begin walking and lifting weights on a modified routine. Anyone who has worked out on any level of intensity knows that you lose it very quickly. I had run a half marathon in mid November and my first seizure was Dec 2nd. By the time I was finally allowed to work out in March I was up more than a few pounds and down more than a few levels of strength and endurance. Frustrated to say the very least! I didn’t want to run with anyone because I was too slow. People at the gym were generous when my instructor told the class about my situation and I had many offers for rides to class. So I followed the rules with weights and began to see progress there. This running thing, this was a different beast. I had been walking so I thought I would be able to run without too much trouble. One stinking mile. Tears tears tears. I felt so pathetic. The road has been my go to for years now. It’s my zone and if ever I needed a zone it was now. If I can’t have running this is just not gonna work for me. I felt so defeated. For weeks I would try to go out and run. Sometimes I would manage a couple, maybe 3 miles, other days hardly 1. I would try consoling myself by saying at least I was doing it. I wasn’t consoled. I felt robbed. It would take me back to that angry place again, angry that this epilepsy had stolen something else from me. Then, in those moments He would speak to me, through the lyrics to music. My “It”. I needed to swallow epilepsy and own it. I finally felt like I could say without so much embarrassment that I have epilepsy. I’m a Mom and I am at home with my family. And the rest is really none of your business. No I can’t really say that, but I can say it in my head until I think of something a little snazzier. I am proud of my family and I am fortunate and blessed to be with my children everyday! Now God knows I love the road and I believed He wanted me to have that freedom again. 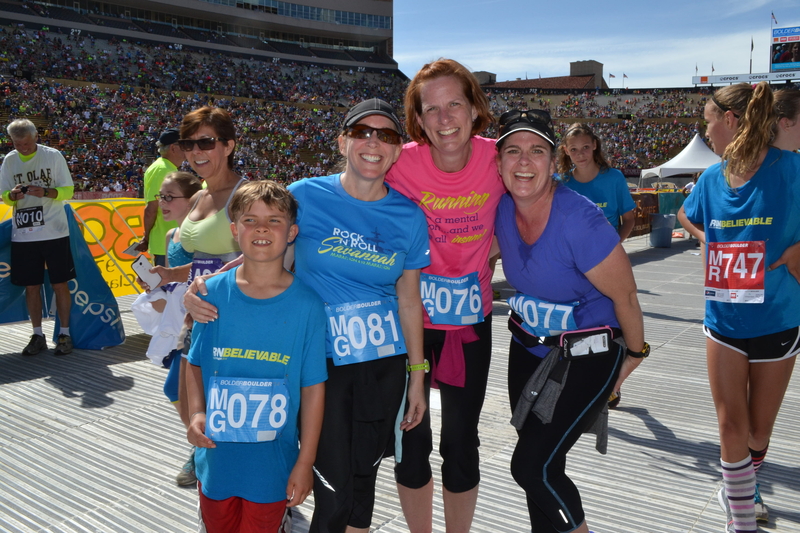 My sweet niece in Colorado called me in early spring to tell me she wanted to run the Bolder Boulder. It’s a huge Memorial Day attraction founded by Olympian Frank Shorter in 1979. The race ends in the University of Colorado’s Folsom Field with the Finish Line on the big screen for added excitement! She told me she and her entire family were running the race together. This was my “It”! My mind was racing. I was not letting my brother and his whole family do this without me! I called my best friend, Sharon. She was the person who asked me to run a half marathon with her way back in 2005. I knew she wouldn’t turn me down. I asked her to fly to CO with me and run a 10K. I’m pretty sure she didn’t even ask me when it was before she said she would go. Next, Mom. Of course she would go. I called my brother and asked if he could make room for 3 more people that weekend. No problem! I had my goal and I had a couple of months to get ready for 6 miles. I hadn’t run more than 3 miles but I was certain I would be able to do this. Fast forward to Memorial Day weekend. I had some really bad runs and one really good 4 mile getting ready for the race. I had some great workouts and one right before the race that I had to completely bail on where the people at the gym said I looked dazed and confused. That’s always reassuring. I was so anxious leading up to the race, it was ridiculous. I was afraid to be away from home. I have been home SO much that I’m actually uncomfortable leaving home now. That’s another issue I have to deal with too. Anyway, my prayer warriors were at work and I knew God is faithful. I knew He had not failed me. I knew I needed to step outside of my comfort zone in order to feel His power rain down on me. Well, guess what? Elevation did not bother us, lack of training did not bother me. I smiled and then I cried like a baby after crossing the finish. I took it all in and looked to the heavens, feeling like I was just a little closer standing there at the base of the Flat Irons. I thanked God for His faithfulness before, during and now. I closed my eyes and the months flashed by and I felt the ground beneath me and I was so grateful for the road I had traveled to cross that finish line. I had given Him fear and doubt and He gave me faith and grace. For every step I was never alone. Indeed He helped me find It. I just needed to rekindle my love with Him. That’s me in the pink! I found my It at the Finish! So officially it is only 34 days until I get the keys back. I feel like I need a refresher course to hit these crazy roads first. I also wonder where I will go? Isn’t that funny? All these months of being at home and learning to consolidate trips to now I wonder where I might need to go? Thank you for being part of this journey with me. For supporting me by reading my posts and giving my an outlet for the crazy thoughts that wonder around in my silly little mind. I hope I give you some laughs, some insight into life that is different from your own and maybe a little bit of something to chew on for another day. This entry was posted in Epilepsy, Faith, Family, Life, Perseverance and tagged Bolder Boulder, driving, Epilepsy, Faith, Family, Fear, Life, Running, seizures. What an inspiration! Ben’s journey has been so private, which made it so difficult. Can’t wait to see you in Montreat. When will you be here?